AirAsia X will become Australia’s fourth largest foreign carrier by the end of 2013 as it allocates nearly all of its additional capacity for the remainder of the year to the Australian market. The expansion will see the medium/long-haul low-cost carrier increase its Australian operation from 35 weekly flights currently to 54 weekly frequencies in Dec-2013. AirAsia X in the process will overtake rival Malaysia Airlines (MAS) as well as Thai Airways and Cathay Pacific in the Australia international seat capacity ranking. Only three foreign carriers – Emirates, Singapore Airlines (SIA) and Air New Zealand (ANZ) – will offer more seats in Australia in Dec-2013. The expansion is made possible by a new air services agreement between Malaysia and Australia which increased total capacity to Australia’s four main cities by 40%. AirAsia X plans to continue to pursue expansion in Australia in 2014 and beyond, with more flights from Kuala Lumpur and new services from its planned second base at Bangkok. Australia has been an important and profitable market for AirAsia X since the carrier’s Nov-2007 launch. Kuala Lumpur-Gold Coast was AirAsia X’s very first route while Melbourne and Perth were both added only one year later, in Nov-2008. Sydney was finally launched in Apr-2012, ending a long battle with Malaysian authorities, which for years resisted allocating Sydney rights to the LCC. AirAsia X announced on 29-Jul-2013 plans to launch Adelaide, its fifth destination in Australia. Adelaide will initially be served from 30-Oct-2013 with four weekly flights, increasing to five weekly flights in Dec-2013. AirAsia X has been looking at Adelaide for some time but held off earlier this year in moving forward with its Adelaide plans in a bid to pressure Australia to agree to expanding the air services agreement with Malaysia. Malaysian carriers technically have unlimited access to Adelaide as the Australia-Malaysia bilateral only caps capacity to Australia’s four biggest airports – Brisbane, Melbourne Tullamarine, Perth and Sydney. But by holding off on service Adelaide Airport and the South Australia government were keen to attract, AirAsia X was able to effectively increase pressure on Australia to expand the seat cap limiting Malaysian carriers. The extended air services agreement was signed in Jul-2013 but AirAsia X was already banking on the deal happening as it previously started to sell additional Australia flights to Perth, Melbourne and Sydney that were contingent on a higher seat cap. AirAsia X will have two daily flights in each market by Dec-2013, with Melbourne going double daily in late September followed by Perth and Sydney in late November. AirAsia X currently operates seven weekly flights to Perth, 11 to Sydney and 12 to Melbourne, according to Innovata data. The carrier is also increasing Gold Coast, which falls outside the air services agreement, from five weekly flights to daily from late Nov-2013. 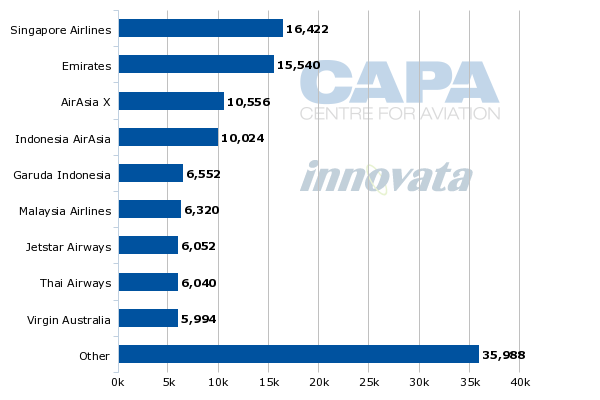 The 54 weekly flights to five Australian destinations in Dec-2013 will give AirAsia X 20,538 one-way seats to Australia compared to only 13,195 seats currently, according to CAPA and Innovata data. This will give AirAsia X a 4.5% share of total international seat capacity in Australia. Only three foreign carriers – Emirates, SIA and ANZ – will have higher shares. AirAsia X is currently the seventh largest foreign carrier in Australia, behind Emirates, SIA, ANZ, Cathay Pacific, MAS and Thai Airways. Even before the Adelaide announcement, AirAsia X was poised to overtake MAS as the largest carrier in the Malaysia-Australia market based on the planned double daily services to Melbourne, Perth and Sydney and single daily service to the Gold Coast. MAS currently offers just under 15,000 weekly one-way seats to Australia while AirAsia X has about 13,200 seats, according to CAPA and Innovata data. MAS’ capacity to Australia is expected to reach about 16,700 seats for the peak season in Dec-2013. This will give MAS a 42% share of the market compared to 49% currently. AirAsia X will see its share increase from 43% currently to 51% in Dec-2013. Emirates, the only other carrier operating non-stop flights between Malaysia and Australia, will see its share of seat capacity in the market decrease from 8% to 7%. Emirates operates one daily 777-300ER flight from Kuala Lumpur to Melbourne and now codeshares on the route with its new partner Qantas. As part of the new Malaysia-Australia air services agreement Qantas gains unlimited codeshare rights beyond Kuala Lumpur. Qantas, which has no intentions of operating its own services to Malaysia, requested the third country codeshare rights. 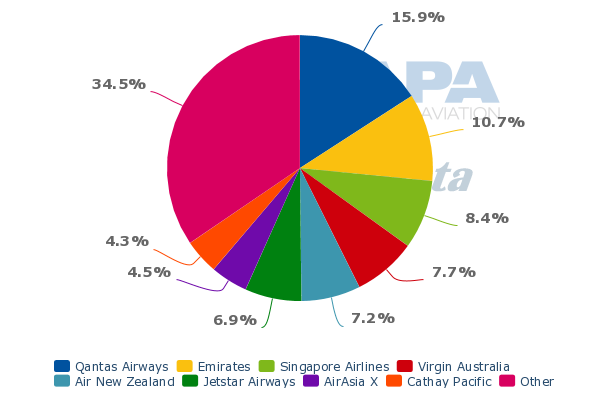 The Qantas-Emirates partnership has significantly soured relations between oneworld members Qantas and MAS, which sees Emirates as a major competitor and in early 2012 had come close to forging a close partnership with Qantas. MAS currently operates 52 weekly flights to five Australian destinations, including two daily flights to Melbourne and Sydney, one daily flight to Adelaide and Brisbane and 10 weekly flights to Perth. MAS now uses A330-300s on all its Australian flights – the same type used by AirAsia X but MAS configures its A330-300s with nearly 100 fewer seats. The upcoming increase in capacity to Australia by MAS is partly driven by the launch of flights to Darwin, which will be served with five weekly flights from 1-Nov-2013 using 737-800s. On a year-over-year basis MAS’ seat capacity will be up 12% compared to Dec-2012 levels while AirAsia X’s capacity will be up 54% in Dec-2013 compared to Dec-2012 levels. Emirates’ capacity will be flat. AirAsia X is currently offering the same amount of capacity as it did during the peak season in Dec-2012 but temporarily reduced capacity to Australia by about 20% from February-2013 through Jun-2013. AirAsia X is expected to maintain 54 weekly frequencies to Australia following the end of the Southern Hemisphere summer peak season in Feb-2014. The new total of 80,000 return seats for the Malaysia-Australia market could result in an over-capacity situation, particularly during off-peak months. But over time the approximately 20,000 seats that are being added should be adequately absorbed particularly given AirAsia X’s successful track record of stimulating demand with its low fares. The Malaysia-Australia market can be stimulated as there is a large component of price conscious travellers, including students as a large number of Malaysians chose to study in Australia. There are also a large number of leisure passengers, driven by growing demand from Malaysians holidaying in Australia and Australians holidaying in Malaysia or other parts of Asia (AirAsia X offers connections in Kuala Lumpur to destinations across the AirAsia X and AirAsia short-haul networks). AirAsia X CEO Azran Osman-Rani says the carrier’s Australian routes see an even split with 50% point of sale in Australia and 50% in Asia – a ratio the carrier expects will be maintained as it expands. Mr Azran told the CAPA Australia-Pacific Aviation Summit on 7-Aug-2013 that the carrier also plans to maintain Australia’s share of its overall business as it continues to expand. 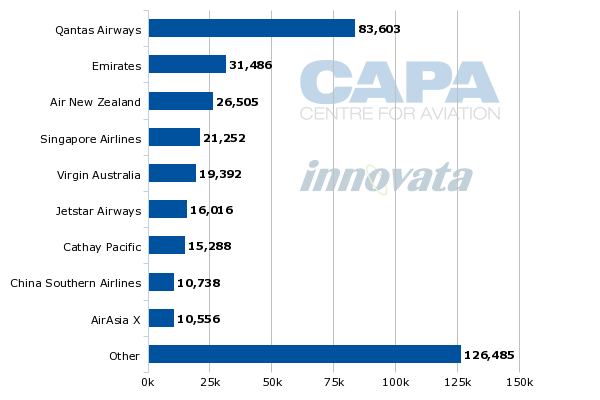 Australia currently accounts for 32% of AirAsia X’s seat capacity, according to CAPA and Innovata data. This will increase to almost 40% in Dec-2013 as almost all the capacity AirAsia X is adding over the next few months is allocated to the Australian market. 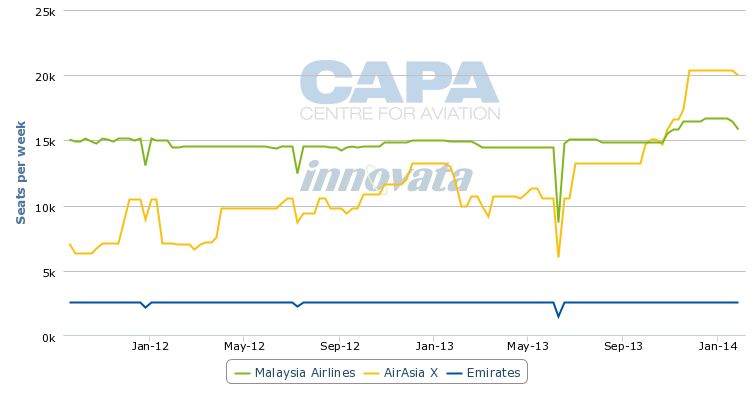 On an ASK basis, Australia will account for 48% of capacity in AirAsia X’s network in Dec-2013 compared to 40% currently. Australia also has been a big contributor on a revenue and profit basis, making it an obvious market for further expansion. Australian routes generated MYR234 million (USD71 million) in revenues in 1Q2013, accounting for 44% of AirAsia X’s total revenues. 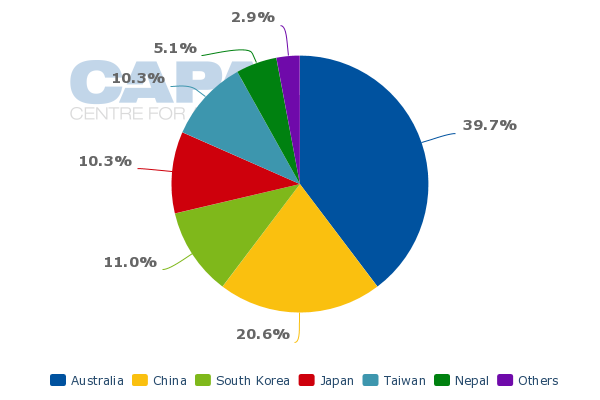 Australian routes accounted for only 33% of total revenues in 1Q2012, the last quarter AirAsia X operated services to the Europe, India and New Zealand. For the full year 2012, Australian routes accounted for 38% for AirAsia X revenues compared to 33% in 2011 and 42% in 2010. Australian routes also accounted for 44% of the carrier’s operating profits in 1Q2013. Australia has consistently been the most profitable segment for AirAsia X. From 1-Jan-2010 to 31-Mar-2013, AirAsia X generated MYR428 million (USD130 million) in operating profits from its Australian routes. North Asian routes accounted for MYR368 million (USD112 million) in operating profits during the same period while AirAsia X incurred losses in its since discontinued operations to Europe, India and New Zealand and turned modest profits in its small operations to the Middle East and West Asia. Australian routes generated MYR169 (USD52 million) in net profits before taxation from 1-Jan-2010 to 31-Mar-2013. AirAsia X needed to expand in Australia in 2013 in order to maintain Australia’s share of its total pie as the carrier is expanding its A330-300 fleet this year from nine to 16 aircraft. 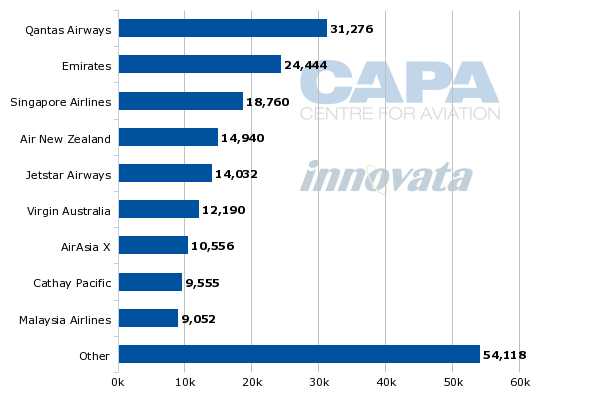 Most of the capacity added so far in 2013, with the four new aircraft delivered year to date, has been in other markets. But nearly all of the capacity being added over the remainder of the year as another three A330-300s are delivered is being allocated to Australia. With the Adelaide announcement AirAsia X finalised its Dec-2013 schedule based on the full 16-aircraft fleet, with the equivalent of just under eight aircraft being allocated to Australia. The carrier is now starting to work on network plans for 2014, when it will take delivery of another seven A330-300s. 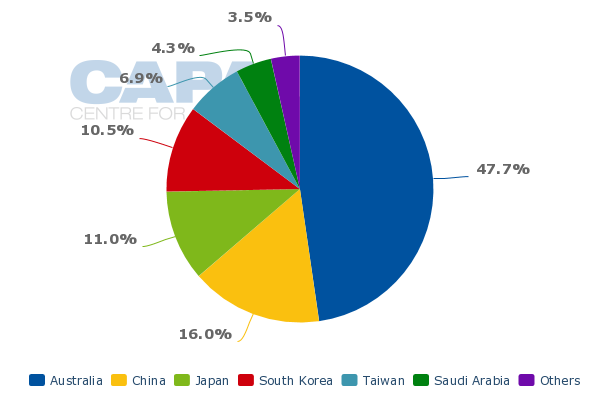 Australia is expected to again factor in 2014 expansion plans along with Japan. The Australia expansion in 2014 will most likely come in the form of new flights from Bangkok, the base for new joint venture carrier Thai AirAsia X. Thai AirAsia X is currently in the process of securing an operating certificate from Thai authorities and will likely launch services in 1H2014. Thai AirAsia X will focus on leveraging the existing AirAsia X network by serving several of the same destinations already served from Kuala Lumpur. Australian destinations, in particular Melbourne and Sydney, as well as North Asian destinations in South Korea and Japan are expected to be part of the initial Thai AirAsia X network. AirAsia X's Malaysian base will also see further expansion in 2014 with an expected focus on Japan. AirAsia X is planning to first upgrade its Kuala Lumpur-Osaka service, which is now operated four times per week with a fifth frequency to be added in Nov-2013, to daily. AirAsia X also has been looking at potential third and fourth destinations in Japan after Osaka and Tokyo Haneda, which is already served daily. Fukuoka, Nagoya and Sapporo are all under consideration. AirAsia X will likely not pursue further expansion in the Australia-Malaysia market in 1H2014 and instead give the capacity being added in 4Q2013 some time to be fully absorbed. But additional capacity in the Australia-Malaysia is possible in late 2014 and 2015. Other Australian airports continue to court AirAsia X including Cairns, which is eager to regain a non-stop link to Southeast Asia. Upgrading Adelaide to daily is also likely in the medium to long-term as AirAsia X aims to serve all the destinations in its network at least once per day. A flight to Brisbane to supplement Gold Coast and a third daily flight to Melbourne, Perth or Sydney would also be medium to long term possibilities for AirAsia X. But these could require yet another extension of the Malaysia-Australia air services agreement. While the new agreement increased total seat capacity to the four main Australian airports by 40%, sources tell CAPA that all or nearly all of this capacity has already been allocated by Malaysian authorities. AirAsia X is already using most of its allocation while MAS is considering starting to use some of its new allocation in 2014. MAS previously planned to increase capacity to Australia by up-gauging some of its Melbourne and Sydney flights to A380s. But as CAPA previously reported, MAS was unable to proceed with initial A380 plans for Australia as it discovered there was not sufficient room in the Malaysia-Australia bilateral to support A380 flights without reducing frequencies. MAS wants to maintain double daily services to Melbourne and Sydney as the two flights are needed to maintain connectivity throughout its network. AirAsia X similarly sees the benefit of double daily services to Melbourne, Sydney and Perth as it opens up a wider range of connections than the initial single daily service. Melbourne and Sydney are hopeful that MAS will relook at using the A380 to Australia now that the bilateral has been extended. The airports have been told that the A380 is not a possibility in the short-term as the carrier’s current A380 fleet is fully utilised. MAS now operates A380s on both of its two daily London flights, its one flight to Paris and one of its three Kuala Lumpur-Hong Kong flights. But there could be an opening for Melbourne and or Sydney in 2014 when MAS is able to operate for the first time a six-aircraft A380 schedule. MAS has received all six of its A380s but is in the process of returning one aircraft at a time to Airbus for wing repairs. This process began in 2Q2013 after MAS took its sixth A380 and is expected to be completed sometime in 2014. Australia could also see the A380 should MAS decide to reduce capacity on any of its current A380 routes. Another option for MAS would be to increase capacity to Australia by adding more A330 flights. Increasing Brisbane and Perth, potentially to double daily, would almost certainly be used with A330s while for Melbourne and Sydney MAS has the option of up-gauging some flights to A380s or adding a third A330 frequency. Some Australian airports have already begun lobbying their government to further open up the bilateral with Malaysia, fearing they could soon again find themselves in a situation where Malaysian carriers are unable to add flights due to bilateral constraints. AirAsia X, and in general Asia’s emerging long-haul low-cost sector, has been the main driver of international traffic growth in Australia over the last 18 months. For example, AirAsia X and SIA long-haul low-cost subsidiary Scoot have accounted for a majority of recent passenger growth at Sydney. AirAsia X only launched services Sydney in Apr-2012 and will soon have two daily flights while Scoot began its daily Singapore-Sydney service in Jun-2012. From Dec-2013 AirAsia X will be the sixth largest foreign carrier in Sydney. At Perth, AirAsia X will be the third largest foreign carrier in Dec-2013. The AirAsia brand will be the largest foreign player in the Perth market as Indonesia AirAsia also currently serves Perth with four daily A320 flights from Bali. At Melbourne AirAsia X will be the fourth largest foreign carrier in Dec-2013, following the same ranking as the overall Australian international market – Emirates, SIA, ANZ, AirAsia X and Cathay Pacific. Jetstar will only have 25% more international capacity than AirAsia X in Melbourne despite Melbourne being Jetstar’s base. AirAsia X will be larger in Melbourne than its rival when only including the Jetstar long-haul operation. In Gold Coast, AirAsia X is already the largest of the three foreign carriers serving the airport, ahead of Scoot and ANZ. In Adelaide, AirAsia X will become the sixth foreign carrier, joining Emirates, SIA, MAS, Cathay Pacific and ANZ. It will immediately be bigger in Adelaide than Cathay and ANZ. AirAsia X has had a monumental impact in Australia, stimulating new demand and driving big growth in the Australia-Malaysia and broader Australia-Southeast Asia markets. The carrier’s consistent profitability in Australia while it has struggled in several other markets has proven the Australia-Southeast Asia market is ideally placed for the medium/long-haul low-cost model. AirAsia X will continue to expand in Australia, building on the strong brand it has built in the market over the last six years. Kuala Lumpur will see more Australia capacity, beyond the 54% increase planned for 4Q2013, as AirAsia X looks to leverage its now leading position in the Malaysia-Australia market. But perhaps more importantly, AirAsia X will look to start to leverage its strong position in Australia by serving multiple Australian airports from its new bases, starting with Bangkok and to be followed potentially by Bali and Manila. Australia is well positioned to continue to benefit from AirAsia X’s rapid growth as the carrier accelerates expansion using the proceeds from its Jul-2013 initial public offering. AirAsia X has quickly become the fourth largest foreign carrier in Australia. The group will continue to drive international traffic growth across several of Australia’s airports and the long-haul LCC juggernaut continues its onslaught on the Asian market. This is the first in a series of reports on Australia-Asia markets. The next report will look at the Philippines-Australia market, where an impasse in bilateral negotiations is blocking the potential launch of services by Cebu Pacific.